With a diameter of 800 mm and 18 light sources, the chandelier 818 is a compact version of the luminary 1800. 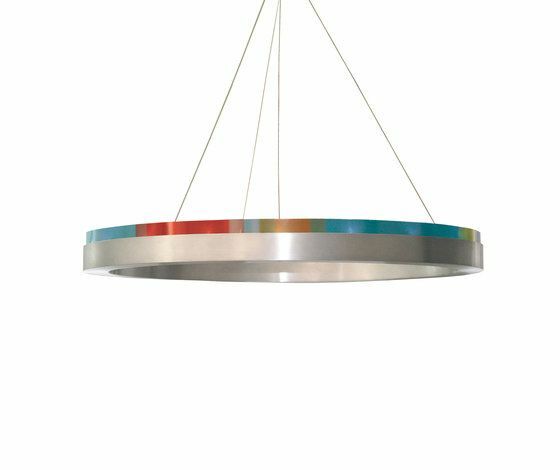 Made of brushed or coloured aluminium with black translucent or coloured polycarbonate shades, 818 floats over tables, counters, in reception areas or living spaces and offers light and atmosphere. 818 is equipped with 18 x 10-20W/ lamp base G4 (818/10W or 818/20W) low voltage halogen, or with 18 mains voltage LEDs 3,3W each/200 lumen in warm or cold white (818L). Height 70 mm, diameter 800 mm.